TR XII (2001) – Wow, What A Ride! 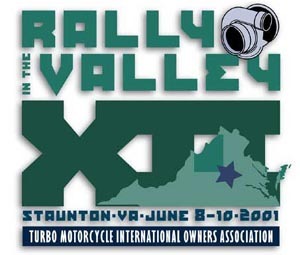 For Turbo Rally XII our rally host and past TMIOA president Allen Lough selected the site of a previous rally, Turbo Rally V (1996) – The Dutch Rally, in Staunton, Virginia, but this year it wasn’t just another Rally in the Valley. At the Dutch Rally, rainy weather kept many of us from enjoying a second day of Shenandoah Valley scenic byways, but not this time. Perfect 80-degree weather blessed the entire weekend and rally goers took full advantage of the summer-like riding conditions. 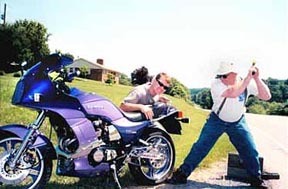 Mike Chestnut (TN) and Roger Twito (TN) arrived on Thursday and rode the surrounding mountains all day Friday. 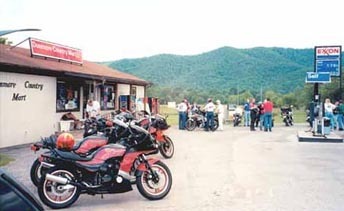 By the time I (PA) arrived with Steve Klose (NJ) and Paul Brown (MD) it was 7:00 p.m. Friday evening and most of the other riders were assembled at the Days Inn and ready for some southern home-style cooking at the local landmark, Lowe’s Restaurant. At Lowe’s there were some familiar faces like John Marrs (GA), John McCullough (VA), and Colin Goodall (ONT) and plenty of new faces like Trevor Topley (ONT), (VA), Mike Roeback (IN), and Bill Ey (MD). The dinner conversations continued back at the Days Inn parking lot until the fatigue of the days riding overcame the excitement of another Turbo Rally and by 11:30 p.m. the parking lot was devoid of riders but full of shiny turbocharged motorcycles including Mort Milne’s (PA) immaculate Z1R-TC Kawasaki Turbo. On Saturday morning, Allen distributed route sheets for a “Best of the Best” ride on some of the finest motorcycling roads in one of the top riding areas in the country. At 9:00 a.m., the aforementioned turbo riders plus Glen Edwards (MI), Dan Topping, Andy Christensen, Mike Abraham (VA), Ernie Lough (VA), Kelly Smith (VA-our first female turbo rider), John Ey (MD), Carlos (VA) and non-turbo riders Tony G., Eric Morphet (MD), Robert Mitchell (VA), Ron Bussey (TN), and Leon departed the Days Inn with the look and sound of a Superbike warm-up lap. Allen’s routes lead us down I-81 for two exits, then past the farmland scenery of VA 252. Forty miles later we turned onto VA 39 and climbed a long and winding road for the 15-mile, 2000-foot pull over Goshen Pass. We made a quick stop in Goshen at the Mill Creek Cafe for refreshment and then continued on VA 39 and Huntersville, sixty miles away. With a bright blue sky and little traffic, everything was going fine until we crossed Warm Springs Pass and a leaning-through-the-gravelly-corner maneuver by a CX500T rider and the first known instance of a rider trying to make a CX650T fly were attempted Neither were successful. 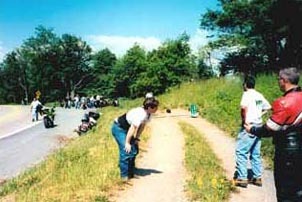 After the riders were patched up by the friendly emergency services crews, Colin Goodall and John McCullough volunteered to retrieve the necessary tow vehicles from the Days Inn while the rest of us motored onto Huntersville at a reduce pace. In Huntersville we turned onto another of Virginia’s best motorcycling roads in the form of VA 28 and we paused in Dunmore for a refueling stop where some riders refused to pay the $1.80 we-have-it-here-in-the-boonies-and-you-don’t per gallon price. VA 28 lead us to US 250 (a road that received a glowing write-up from the jaded California press in a national motorcycle publication) in Thornwood with our stomachs growling almost as loudly as the many ZX Turbos with aftermarket pipes. The Maple Inn awaited us in Monterey, but before satisfying our hunger for food US 250 satisfied our cravings for curves in the form of a 3500-foot pass over Back Creek Mountain through an area known as the Virginia Highlands. Lunch may have been simple southern style with plenty of turnip greens and pinto beans, but trying to fit that long row of turbo bikes parked neatly at the curb was a big challenge. From Monterey, it was up and over once again across 3760-foot Shenandoah Mountain before the descent into Churchville and a return to Staunton and the Days Inn. It had been a long 275-mile day of riding made longer by sympathetic thoughts for two turbo riders. Paul Brown and I stopped on the downhill side of Shenandoah Mountain for some action shots through a particularly thrilling corkscrew turn. By the time we returned to Turbo Central, John Marrs had organized another excursion to Lowe’s Restaurant under the premise that he had to confirm last night’s dinner was as good as he remembered. None of us argued with that logic. On Sunday morning the gathering of turbos in the Days Inn parking lot was noticeably thinner. 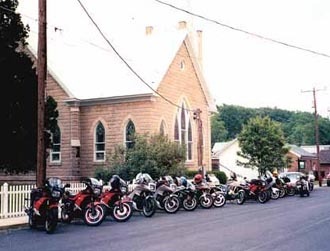 A small group of riders decided to take advantage of the weather and the roads by taking a slower-paced tour, as opposed to a follow the leader freight train, through the beautiful Virginia/West Virginia scenery with the hope that they may actually see some of it. Steve Smith and his Purple Passion ZX Turbo made a late arrival on Saturday morning at 11 a.m. (thereby missing the group) caused by two pothole-induced blown tires on his tow vehicle. 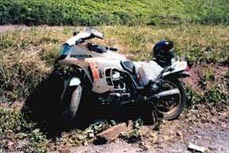 His bad luck continued on Sunday morning when another bad spot in the road bent the widened rear rim of his Kawasaki. Roadside repairs using a 2 X 4 and a hammer straightened the wheel enough for it to hold air until the end of the Sunday ride. Monday morning was again an ideal day for motorcycling and I enjoyed a 330-mile ride along Virginia, West Virginia, Maryland, and Pennsylvania back roads en-route to my retreat in the Pocono Mountains. After 1200-miles, much ribbing about my lock on the Rat Bike Award (hey, I want to see your bike when it’s got 100,000 miles), and a healthy dose of southern hospitality, it was over. Another Turbo Rally was in the books. With the addition of wives, girlfriends, and sisters, this Turbo Rally had much more of a family atmosphere than past events. It had been two days of perfect weather, the best roads, and much Turbo Talk. That made it the Perfect Weekend. THE TURBO RIDERS AND THEIR BIKES: Mike Abraham (CX650T), Paul Brown (CX650T), Carlos (XJ650LJ), Mike Chestnut (ZX750E), Andy Christensen (CX650TD), Glen Edwards (ZX750E), Bill Ey (XJ650LJ), John Ey (ZX750E), Colin Goodall (CX500T), Paul “Oh no, not the stator!” Hograrian (CX650T), Steve Klose (ZX750E), Allen Lough (XJ650LJ), Ernie Lough (ZX750E), John Marrs (CX500T), John McCullough (CX500T), Mort Milne (ZX750E and Z1R-TC), Mike Roeback (ZX750E), Kelly Smith (XN85), Steve Smith (ZX750E), Trevor Topley (CX650T), Dan Topping (CX500T), Roger Twito (ZX750E). THE WANNA BE TURBO RIDERS AND THEIR BIKES: Ron Bussey (R1100RT), Tony G. (Concours), Robert “See My 90 mph Wheelie” Mitchell (GSXR1000), Eric Morphet (ZX9). PLAQUES: Best Honda 500 Turbo – John Marrs, Best Yamaha Turbo – Allen Lough, Best Honda 650 Turbo - Dan Topping, Best Suzuki Turbo – Kelly Smith, Best Kawasaki Turbo – Roger Twito. CERTIFICATES: Longest Distance Solo - Colin Goodall, Longest Distance Two Up – Ernie Lough, Longest Distance Trailered – Glen Edwards, Shortest Distance Trailered – Steve Smith, Highest Mileage Turbo (original owner) – Colin Goodall, Permanently Addicted (Jordan Miller Award) – Dan Topping, Methuselah Award – John Marrs. Gassing up then headin' for those mountains on the way to Monterey, West Virginia. Sunday's ride was a bit more relaxing. Robert Mitchell (MD) and Colin Goodall (ONT) "finesse" Steve Smith's dented rear wheel. The infamous crash and Dan Topping's(GA) wadded CX500T. 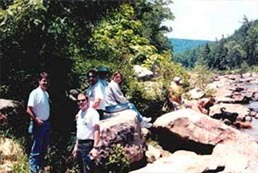 Andy Christensen (OH), center, and Dan Topping, second from right, reflect on the damages. Chris Reed (DE), right, was between Dan and Andy but made it through upright.